05.15.2008 - Rodents that live in attics cause more problems than just annoying noise. They also cause a number of different types of damage inside an attic, some of which are serious. Look at the above photo, and you will see several types of rodent damage in this customer's attic. Rat Droppings - Rats have high metabolisms, and they leave many droppings, often thousands, in an attic where they live. These droppings may or may not smell bad, but they are unsightly and they do carry disease that people can contract if they come into contact with the droppings. Rat Urine - You can see some water-stained areas on the sheetrock. These are actually urine stains. Rat urine has a pheromone scent that attracts new rats to the area. Rat Grease - Rats have some sort of brown grease in their fur. This grease also has the pheromone scent. When rats travel the same area over and over, this area becomes stained brown. You might notice the brown staining on the top wooden beam, especially where the gray wire crosses the beam. Chewing on Wires - This is perhaps the most dangerous damage that rats cause, because if they expose the copper inside, and it touches the wood beams, you've got a recipe for an electrical fire in your attic, and yes, this'll likely burn your house down. Chewing on Valuables - You can see the bits of paper chewed on. If you store things in your attic, the rats will chew on them and destroy them. I'm assuming that you're storing stuff in your attic because you want to keep it, rather than throw it out, but when the rats get done chewing and pooping on your stuff, you'll probably rather throw it out anyway. Matted Insulation - Rats run over and over the insulation, and matt it down, reducing the insulation's R-Value and effectiveness. They also clear out insulation in areas as they collect it for nesting material. Lower insulation of course raises your heating and cooling bills - not that this is your biggest worry if you have a rat infestation. Dead Rats - Of course, the dead rat in this photo is dead because of the trap that I've set. However, rats don't live very long, and they often die inside the attic, and when they do, they cause a horrible odor as they rot and decay. Okay then, you now realize the damage that rodents cause in an attic. 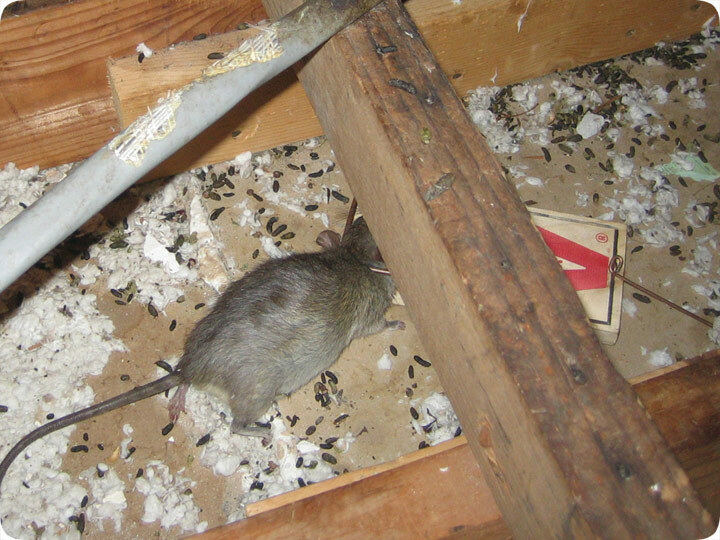 How do you prevent rodent damage in the attic? By employing a full rat control program! This entails the sealing of 100% of the rat entry points into the house, the trapping and removal of all rats inside, and a full attic cleanup to remedy the mess and the scent that they leave. I have much more information on rat control on other pages within this blog and website, so browse on! Do it yourself: Visit my How To Get Rid of Rats page for tips and advice. Other rodents: Or visit my Get Rid of Mice page or Get Rid of Squirrels page.